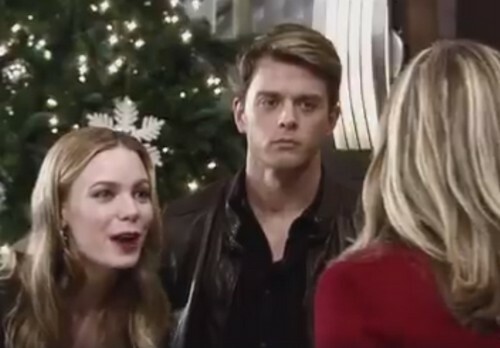 General Hospital (GH) spoilers tease that Michael (Chad Duell) will struggle to stick to his guns. He assured Nelle (Chloe Lanier) that they were through for good, but that may not be true. The sympathy card’s already in play thanks to Nelle’s fainting spell. She also has a job now, so that eliminates another source of conflict. Plus, Carly (Laura Wright) just recapped some of her own history to Michael and the ugly details are just as bad as what Nelle’s done. She thinks Nelle’s such a snake, but Carly was once the slithering queen. Nelle might be capable of change if people would stop backing her into corners, but Carly certainly has no intention of giving her any more chances. Michael, on the other hand, will continue to soften. He specifically asked Carly if she thought having him made her a better person. Carly replied that it was her love for Michael that changed her. Now Michael may believe Nelle could become a better person once she has a child to adore. As Nelle’s pregnancy moves along, GH spoilers say Michael will grow much closer to her. They could be on the verge of a reunion and Carly will see it coming. She’ll voice her complaints, but she can’t really tell Michael how to live his life. If Carly wants to stop their blooming love, she’ll have to do something drastic. General Hospital spoilers state that Sonny (Maurice Benard) will have to handle a family crisis soon. He’ll use some of his special skills to tackle the problem. Will Carly talk Sonny into changing the paternity test results? Nelle agreed to have the test done, so she seems pretty confident this baby is Michael’s. Carly may decide that they just can’t let Nelle gain a hold on Michael forever. Sonny made it clear that all Carly had to do was say the word and he would handle things. Carly may not want to resort to murder, so a rigged paternity test is the easy way out. Of course, Nelle would be stunned and completely confused. Michael would think Nelle manipulated him again and he would never listen to her attempts to deny the results. That would be the ideal outcome for Carly, but this plot would undoubtedly backfire. All good schemes must be discovered eventually. Michael could find out about the deception, reunite with Nelle and turn against his parents. Will Carly make another one of her ill-advised moves? Will she only succeed in pushing Michael and Nelle together? We’ll give you updates as other General Hospital news comes in. Stay tuned to the ABC soap and don’t forget to check CDL often for the latest General Hospital spoilers, updates and news.